Meridian Coin has long held a presence buying and selling coins in the South Bay community, on the national coin show circuit and to dealers and clients nationwide. One of the things we also spend a lot of time doing, locally, is educating people on a whole host of subjects as it relates to coin pricing and making the correct decisions when buying and selling. Another passion of ours is finding areas in the coin market that are inaccurately priced and offer true potential returns for clients. Starting November 2018, Meridian Coin will be actively selling several products that we believe offer medium to long term returns for astute investors and collectors. It is our opinion that there are signs that larger scale economic and investing cycles could be starting to switch. Nearly a decade of solid and phenomenal returns in the stock market and real estate, coupled with low interest rates could be setting the stage for a good rally in the precious metals markets as cycles change. In the future, we will provide a more in-depth article and study on the areas that we have chosen to market. We will also give a more in-depth explanation for how we see the future role of numismatists/coin dealers operating with there clients. For now, let us tell you what we will be selling and how the process will work. 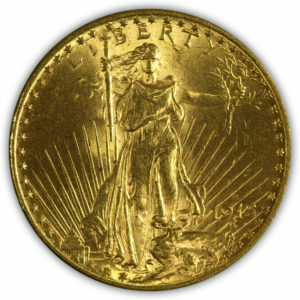 $20.00 Liberty Gold Double Eagles MS62. PCGS or NGC graded. Spot free. $20.00 Liberty Gold Double Eagles MS63. PCGS or NGC graded. Spot free. $20.00 Saint Gauden Double Eagles MS63. PCGS or NGC graded. Spot free. $10.00 Indian Head Eagle. MS63. PCGS or NGC graded. Spot free. 3) There is no sales person you will deal with. All transactions will be confirmed and locked in with David Cloyed, CEO/President of Meridian Coin. Our new strategy is to function like an broker/advisor, keeping overhead low and providing clients with an entry point as close to the real market value as possible. 5) All funds will be sent to Meridian Coin via bank check or bank wire. All transactions over $25,000 will require a wire. 6) Once funds are confirmed good, shipment/delivery of the product will be sent via insured mail or picked up at our location in Torrance. This will generally be a 48-72 hour turnaround time from time of payment to time coins are delivered to client. 7) We make a fixed profit on each unit, generally $35-$45. 8) We will answer any and all questions that a client might have about the product or process before the transaction is consummated.